You know what two really great things are? Blog tags and books. Do you know another really great thing? ABBA. 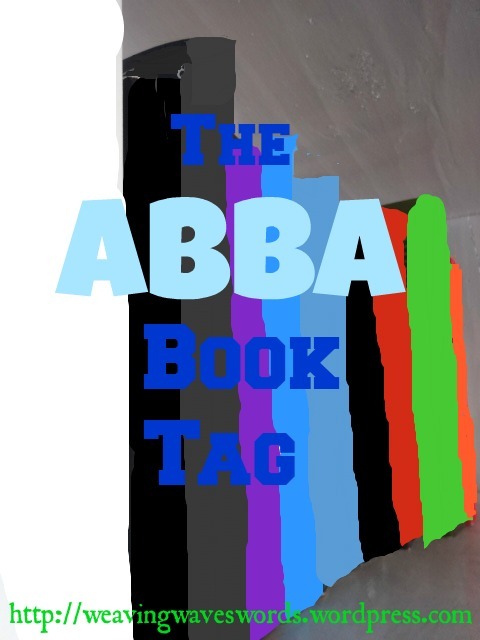 Using this genius equation of funthing+ greatthing+awesome thing, I have decided to make an ABBA book tag. Now, I know that ABBA does not have the most meaningful lyrics in the world, but they are a lot of fun. If you don’t know what ABBA is listen to this and this, and be enlightened. And then you should do this really awesome, crazy fun tag. If you haven’t listened to ABBA before, go do that before you begin. Find books that match the categories. If you want to add other ABBA songs/lyrics and make more categories, you can do that too, and it will be awesome. I really liked Atonement, a book I had to read for school, which surprised me, but it turned out to be very interesting, and excellently written, even though some of the subject matter was awkward. Red Queen by Victoria Aveyard. I haven’t read it yet, though I’d like to at one point, but there are a lot of opinions and news about it going around. I’m not sure if this counts, because I’m currently reading it, but Walk On Earth A Stranger is set during the California Gold Rush, and is amazing from what I’ve listened too (audiobook) so far. Also the cover is really amazing, which helps. I just got Six of Crows on my kobo, and it was published last week. I adored the Grisha trilogy, so I’m really excited for this one, and I’m going to read it over the next week while I’m away. You guys are probably sick of hearing this, but Sabriel A Brief History of Montmaray Chanda’s Secrets The Dream Thieves (I know, I’m shaking it up) is a really amazing book. Winter by Marissa Meyer. Actually, Shar is awesome, and she got me a preorder for my birthday last week, but I would still pay lots for it, because I’m really excited about it. This is a sort of hard question (and I wrote it, so…), because many of the books I read come from me finding them, because they’ve been getting attention. Still, though, Brown Girl in the Ring is excellent speculative fiction with Caribbean culture. Go read it! I hate it when plots are recycled (and lets face it, that is what the new twilight book is) But another book that copies a lot of plot is Better Than Perfect- it fell for every high-school contemporary stereotype you could think of (parties, secret talents, cheating on your boyfriend, instalove), and it just felt like a mashup. It was trying to be about messy real life, but just annoyed me in the end. There is only one book that I’ve really hated this year, and that is Love in the Time of Global Warming. It did not work for me at all. This is actually a series: Harry Potter. I think I’ve grown out of Harry Potter to some extent, but I still really like it, and I know a lot about it, because I’ve reread the books so many times. So, do you like ABBA? Are you going to do this tag? answer your two favourite categories in the comments! Thank you for tagging me – I can’t wait to gave a go! Thank you Beth! That story is hilarious (but mortifying too). I’m excited to read what you come up with! YESSSSSSSSSSSSSSSSSSSSSSS ABBA. I totally listened to the soundtrack of Mamma Mia like three times last week. I love a lot of their songs—your descriptions are perfect! I just got Six of Crows the other day and I’m so excited to start reading it, like you! Also, I’m super excited to read Winter. 😀 Life is good. Thanks so much for tagging me—I look forward to doing this as soon as possible! ABBA is the best :). I love that movie in all it’s ridiculousness XD I’m glad you like my descriptions, they were very fun to write. I finished Six of Crows this week, and it was fabulous. *hi fives for winter enthusiasm* I’m excited to read your tag! Ooh, I love this tag! I was introduced to ABBA when everyone told me Winner Takes All’s title sounded like one of their songs, so I do have a soft spot in my heart for them even if I don’t listen much to their music. I love your associations with each song title, super looking forward to doing this tag! Hmm, I think I was one of those people XD Yay, I’m looking forward to reading it!